As you probably know already it's National Vegetarian Week! In fairness I didn't know either and I live with a full time vegetarian. As for me - as regulars will know I do like vegetarian cuisine and I probably cook veggie meals more frequently than I do carnivorous ones. The items in today's and Sundays veggie reviews were sent to me as part of this week which highlights the health and environmental benefits of being vegetarian - even if only partially. It's pretty surprising how easy it is to do these days - in the UK at least - in other European countries the choice is frequently less enticing. First up we have a raw vegetable drink. This sounds naturally unappealing. 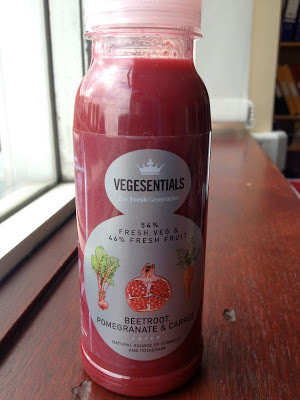 As things like carrot juice and beetroot juice are fairly innocuous a quick read of the bottle puts your mind at rest and we can go in for a taste. Well - that is if you can get past the smell. This smells like vegetables, more specifically compost! I believe this is as they haven't added the sugar and smells that most companies would to help with that first gulp. As a dedicated SnackHead I was not put off and the flavour is as expected, nice but not sweet. The beetroot and the carrot are the main flavours, with each taking a turn in the spotlight and the pomegranate just perks up a little at the end. I wasn't convinced on the odd-looking red liquid before I tasted it, but I made it through both bottles without the original plan of donating the other bottle to another fan of healthy drinks. I want to try more varieties of this so will need to keep an eye on the chiller cabinets. It's 'Raw' as it's pressure treated instead of heat treaded (which from a science point of view increases the temperature anyway - just without adding heat) which is fairly meaningless to me, but I'm guessing doesn't break down the vitamins and minerals as much. I'm happy to consume anything that is nice, convenient and healthy so this is a win all round. I do have a tendency to like all decent ingredient drinks, and dislike all ready meals so the second item was always going to have a hill to climb. This is a plastic-tray style lunch-pot where everything is in one and there is nothing to go soggy so it at least has a fighting chance. Essentially it's beans, veggie mince (not Quorn unfortunately as that truly is the steak mince of the veggie world) and rice - all things I'd enjoy separately. It's also got chilli in which I duly noted and prepared for ahead of time with a large, cold water. This proved somewhat unnecessary. The meal was hot due to the microwave, and less so due to chilli - but it was a pleasant level for a work lunch so it's not something I'd complain about. The ingredients themselves held their textures well. It wasn't a grey mush but a vibrant mix of separate things. There just wasn't that much flavour. One of the unfortunate side effects of the microwave is that flavours tent to become muted, and with this that was a little too apparent. It turned what was probably a rich mix of tastes into a spicy but unexciting lunch. It was more filling than I expected, and also more interesting to eat - I expected mush - but not a flavour winner. It did however comprise three of my 5 a day fruit and veg (Eat as many as you can!) and took me up to four portions that day with the drink during the morning. This is pretty impressive for such a modest microwave meal. While I shouldn't be recommending things that lack flavour I think that carefully sticking to the time guidelines and 're-spicing' the meal after cooking would make this a cheaper and healthier alternative to most canteens. I've resisted having a work spice rack (it's hard as the canteen can be hit and miss unless you use the lovely wrap/sandwich bar) but if I invested in these I'd use Schwartz Peri-Peri mix to make it zing again.